Diamond Strike is a 5 reel, 15 payline slot game with a 96.48% RTP. This UK Online Slot comes with Free Spins and Jackpot. The 5 reel slot by Pragmatic Play keeps the gameplay simple and the payouts impressive with a 96.48% RTP and exciting bonus rounds! Play Diamond Strike on Money Reels today which is home to over 550+ slot games. Our other top games include Rainbow Riches, Bonanza, and Wolf Gold. Keep your slot experience simple with Pragmatic Play’s iconic online slot Diamond Strike. If you are new to online slots, you are sure to appreciate the classic fruit machine feel of the online slot which may not look like it comes with many frills, but there are just enough exciting features with Diamond Strike to make it one of Pragmatic Play’s most popular games. The 5 x 3 reel slot offers 15 different fixed bet lines to play on, which may not seem like a lot, but with the bonus features which we will cover in more detail below, the lack of bet lines is hardly an issue for this game. But you can be sure that free spins, bonus rounds, generous multipliers weren’t forgotten when Pragmatic Play designed Diamond Strike. Diamond Strike is most suited to players with a medium-size budget. You can spin the reels from as little as 15p, or as high as £75 per spin – this amount is the same for every platform Diamond Strike is available on. Whatever you place on a spin, you have the ability to win up to 1000x your original stake amount. That’s £75,000 on one betting line if you decide to play with the maximum betting amount. If you favour simplicity with your online slots Diamond Strike may be the game for you. The entire set up of the online slot has been kept traditional. So, for that reason the symbols have been kept the same as what you will find on land-based slot machines. The symbols include melons, cherries, lemons and plums. If you match three of these symbols you will be awarded with 5 coins, match four and you will be rewarded with 10 coins and matching 5 in a winning combination will reward you with 40 coins. Thankfully the melons, cherries, plums and lemons are just the lower paying symbols on the game. The higher valued symbols include the bell, which will pay 10 coins for every three matched, 20 coins for every four matches and 100 coins for every five matched. The symbol which you will really want to watch out for is the red 7 which can reward you with 10 coins for every 3 symbols matched, 20 for every 4 matched or 200 coins for every 5 matched. The wild symbol on Diamond Strike fittingly is the glistening white diamond symbol. In this game the wild will have the ability to replace all symbols which are on the reels aside from the scatter symbols. You can expect a pay out of up to 300 coins for every pay line the wild features on. Diamond Strike may have been published in 2017, yet, the fact that Pragmatic Play kept Diamond Strike remarkably simple speaks volumes for the fact that although there may be plenty of themed online slots, people still appreciate the more traditional set up of the simple online slots. Even though it may seem that any game developers have the ability to create a simplistic game, Diamond Strike works better than most. The aesthetic side of the online slot is kept fairly minimal. Yet, every time you spin the reels you will be presented with bright and shiny visuals which is paired with a funk-driven Disco soundtrack which may just take you back to the time where flares were acceptable and a disco ball was never too far out of sight. If you’re looking for a high intensity game which just allow you to watch the reels spin and not have to deal with any unnecessary animations Diamond Strike is the perfect option. Yet, despite the energetic feel of Diamond Strike, the online slot still ranks as a medium-volatility slot due to the frequency and the size of the payouts. So, while Diamond Strike may not be the most innovative online slot on the market right now, it still manages to retain popularity by offering a solid structure. Behind the 5 x 3 reel slot set up, the background has been kept minimal, there are no charming characters to cheer you on as you spin the reels, there is simply a blue background which is lit up from the top by blue bolts of lightning where you will find the ‘Diamond Strike’ logo of the game. If you feel that Diamond Strike isn’t for you, don’t worry, there are plenty more exciting titles by Pragmatic Play that pack plenty of more innovative features into the game if you’re looking to mix up the slot experience. We’ll run through them in more detail down below, but first, you may want to learn about the bonus features which Diamond Strike has to offer! Along with the wild symbol (the sparkly white diamond) and the scatter symbols which can pay out up to 300 coins for every pay line you have placed a bet on, there are two other bonus feature which Diamond Strikes generously offers to reel spinners on the hunt for diamonds – or just an impressive offering of instant cash! If you are no stranger to online slots, then the chances are that you will have come across these bonus features before, but why not choose an online slot which features the classics?! 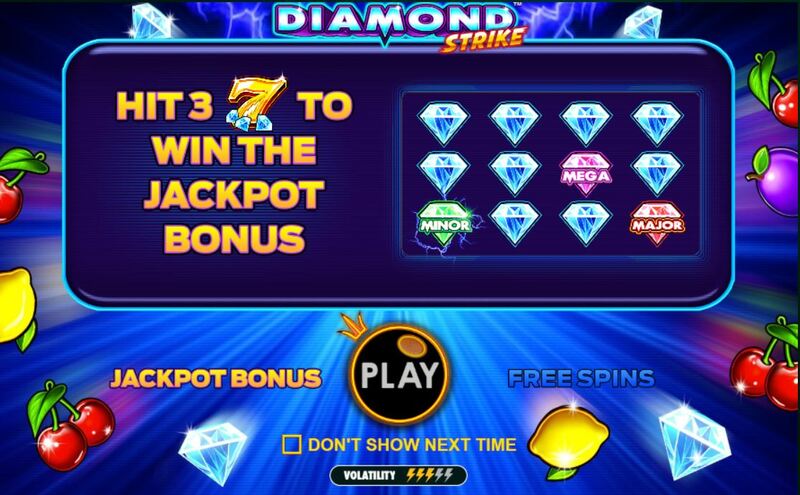 Diamond Strikes comes with an exciting jackpot bonus feature which is triggered when you land three or more lucky Golden 7 symbols which can appear anywhere on the reels on for every spin. If you’re lucky enough for this to happen (and the chances are that you will be) you will be moved away from the game play onto a brand-new game screen which will present you with twelve diamonds. You will get the chance to keep choosing the identical diamonds until you match three jackpot symbols. What makes the bonus game on Diamond Strike even more exciting is that you can win one of three jackpots. If you win the mini jackpot you will receive a 10x multiplier on your original stake, the minor jackpot will pay 30x your original stake, and the major will give you 100x your original stake amount. But what you will really want to look out for in the Diamond Strike bonus round are the Mega symbols. If you match three, you can win up to 1000x your stake! That’s £75,000 if you’re paying on the max betting amount! Not too shabby! Just imagine how many diamonds you could buy with that jackpot amount! The second bonus feature to Diamond Strike is the free spins feature. Many online slots which fail to include a free spins bonus round are quickly criticised for it, so Pragmatic Play were clever enough to ensure that their players were kept happy with this online slot. Free spins can be won when you land the scatters on reels one, three and five. This will then trigger the free spins round which grants you an original amount of eight free spins. But you also have the chance to win even more free spins during this round. To win even more free spins you will need to see more extra diamond wilds land on the reels, there is absolutely no limit to how many free spins you can win here! Pragmatic Play are responsible for most of the popular online slots available on Money Reels, we are proud to feature the company’s exceptional in-house content which was creating by their industry leading talent. With their portfolio which now features over 100 online slot games, they’ve made sure that they’ve represented themselves in every category theme. Yet, with games such as Diamond Strike, it proves that they aren’t afraid to keep their games traditional and simple – which is something that has made their games popular all over the world. In 2019 online slots designed by pragmatic play are played in over 78 countries, to make their games accessible, they have translated their games into over 26 languages. Yet, it is in the UK where Pragmatic Play thrives the most. UK players can’t get enough of the online slots which always offer a high intensity experience. If you head over to Pragmatic Play’s website, you’ll see that the company don’t just stick to creating online slots, they also provide many innovative solutions for online casinos in the forms of online scratch cards, live casino games and bingo games. But back to the online slots, Pragmatic Play keep themselves busy when it comes to the prolific rate of publication of their games. Yet, the standard of their content is never compromised, they always ensure that with each new release, their online slot experiences offer something new to the players. Which is which they have taken inspiration from everything that they could possibly take inspiration from; whether that’s contemporary popular culture or embracing culture from every corner of the world. Pragmatic Play may have started off in the sunny region of Malta, now they are dominating the globe’s online slot world considering that now over 13 jurisdictions around the globe support their games and are happy for their citizens to play them. What many online slot players favour about Pragmatic Play’s game is how much work has been put into the games to ensure that they are as exciting to play on mobile as they are when you log into Money Reels on your desktop or laptop. As long as your phone has the capacity to comfortably support HTML5 online slot games, there will definitely be no compromise when it comes to the graphics or the gameplay. The top games by Pragmatic Play which we also feature on Money Reels are Leprechaun Song, Wolf Gold, Chilli Heat, 3 Genie Wishes, Great Rhino, Gold Rush, Da Vinci’s Treasure and Gold Rush. At this point Wolf Gold has picked up the most awards up to now. But none of their most recent features are ever too far away from the top played slots. Slot Catalogue has listed Wolf Gold as the 10th most popular slot with Mustang Gold and Leprechaun Song also featured on the most played slots. It’s clear that Pragmatic Play are keen to keep up with their prolific rates of publication to get more interest in their new slots, on average, the company is putting out on average 2 new titles a month. That would explain now they have managed to create over 100 online slot games since they first started to release games in 2015. Even though Diamond Strike may not be Pragmatic Play’s most popular slot, they were thrilled to announce the game when it was released in October 2017. Here’s what they had to say about the slot! Considering that Diamond Strike is a very simplistic game which appeals to players who are looking for an online slot experience which isn’t too dissimilar to what you would get with many of the most popular titles from Pragmatic Play. We’ve listed the top three alternatives to Diamond Strike which are currently available to play today! Magic Crystals is almost identical to Diamond Strike in terms of aesthetic. The same blue coloured background features the 5 x 3 reel slot which uses less of the traditional slot machine symbols, an instead you’ll be presented with a selection of crystals which are all worth varying amounts when matched. The downside of using so many similar symbols is that it is a little hard to distinguish what’s what on the reels. But that will all soon become apparent when you strike a winning combo. You’ll have 243 different bet lines to play across, with wilds that can double your reward. The free spins round will give you a tidy 25 free spins to try your luck on and Magic Crystals will also come with a 3x multiplier in the bonus rounds. Pragmatic Play jazzed it up slightly with 7 Monkeys, which still takes place over a 5 x 3 grid reel set up, yet, visually this is one of the most stunning games Pragmatic Play have created. You’ll soon feel right at home with the online slot which is set in the deep depths of the jungle where you are sure to find a monkey or two! As you would have guessed, there are seven different monkeys to match on the reels. With a 92.71% return to player rate, your wins may be fairly rare, but once you do cash out, chances are you will cash out BIG. One amazing bonus when it comes to 7 Monkeys is the chance to win up to 150 free spins. There aren’t that many online slots which give you the same opportunity even with the progressive free spins rounds! You don’t get much closer to Diamond Strike than with Diamonds are Forever – in graphic terms only! You’ll only get the chance to bet across one line with the 1 reel 3 row slots which is very similar to what you would expect from a land-based slot machine, yet the incredible plus side to this game is the fact that you can play at home! There’s the chance to win up to 6000 coins with Diamonds are Forever 3 Lines if you match three of the diamond encrusted sevens, so it’s well worth a spin – especially if you are new to online slots and are looking to get to grips with the set up. And you can’t get much fairer than with the 96.96% return to player rate! If none of the online slots by Pragmatic Play are for you, then there are also plenty of alternatives from game developers such as NetEnt, Playson, and Eyecon. Starburst is king when it comes to simplistic slots, with plenty of bonus features to make up for the lack of pay lines (10), there’s still no wonder why it currently holds the top spot in terms of popularity. The maximum jackpot in Starburst is 50,000 coins which can be won on the 5 x 3 reel slot which offers a fairly generous but certainly not the highest return to player rate of 96.1% NetEnt really did create a gem of a slot with Starburst! Yep, another addition from NetEnt which is sure to be appreciated by anyone looking to mix up their game play experience from what they saw with Diamond strike. Instead of a 5 x 3 reel set up, with Dazzle Me slot, they form a sideways pyramid shape with a 3 – 3 – 4 -4 – 5 layout. As you can expect from such a layout, there’s plenty of bet lines to play across (72) and you’ll have the chance of grabbing an impressive jackpot amount of 152,000 coins! With a 96.1% return to player rate, it’s almost like you’ve got nothing to lose! 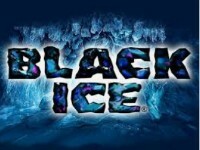 The Black Ice online slot has a slightly frosty feel which is sure to give you a chill, especially if you get your chance to win the mega 10,000 coin jackpot. If the 10 different fixed bet ways aren’t enough then maybe you’ll find the allure in the bonus features which the 5 x 3 reel slot set up offers you. Expect wilds, free spins and bonus features along with the insanely sharp 3D graphics! When it comes to mobile experiences of online slots, the quality of the game play will always fall down to the specs of your phone, so before you spin the reels it is important that you check whether your device has the ability to support HTML 5 games. Chances are you’ll have no problem playing Diamond Strike on mobile mode on Money Reels. As there aren’t any flashy animations to keep up with, your phone will have no problems keeping up with the graphics. Whichever way you play you will want to ensure that you crank the volume up high to treat yourself to a high intensity online slot experience with Diamond Strike! But with mobile, you will get the choice whether you want to play in portrait or landscape mode – both work just as well! There aren’t many game releases which draw so much media attention, but by now, online slot reviewers know that any addition to Pragmatic Play’s portfolio is worth mentioning. Despite the fact that Diamond Strike brought no new innovation to the take with Diamond Strike, there were very few flaws which were found in the game play experience. Here’s what just a few publications had to say about Diamond Strike.